You have a narrow window of time to be involved in the discipleship of the young adults serving at your camp this summer. For some, this opportunity will extend well after the time they are with you at camp. But why not start even before your summer staff arrive? 1. Find disciples. The discipleship of your staff is an essential part of your ministry, because it is disciples who produce disciples. Jesus was selective in finding his disciples, and his choices were surprising. He looked for spiritual hunger, for those who were aware of their spiritual poverty. People did not follow him because they were interested, but because he called them. Look for people who have a calling to camp, not just an interest in camp. If they don't have a fire within them, you will forever have to light a fire beneath them. Look for character over experience and skill. It matters much more who they are than what they know or what they can do! Remember that your campers will aspire to be like them. 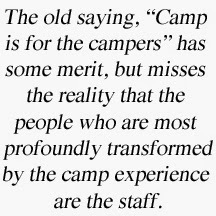 Will you be happy if campers become like this potential staff person? Look for people who are chasing after God’s own heart. 2. Make the most of the interview. Show potential staff that you are ready to invest in them, even before the decision has been made as to whether they will join you for the summer. During the interview, help them reflect on their spiritual readiness for this role. Don't be afraid to challenge them, find them help, get them involved in Bible study or ministry before the summer. Interview everyone, including returning staff, just for the opportunity it gives you to speak truth into their lives. If you have to do it long distance, use Skype or Facetime so that it is more like a real conversation. Make your camp's purpose very clear. Ask: Can you be committed to where we are going? 3. Communicate well. When it was my job to find and recruit summer staff for several years, I found that one of the most common reasons staff chose our camp over others was that we were the first to get back to them. But that is not a good enough reason to be prompt in replying. This is: Let them know they matter to you! Make it your goal to respond to the emails and phone calls of potential staff within 24 hours, even with those who probably will not end up at your camp. 4. Employ social networking. You can’t fight it, so you might as well make good use of it! Create a Facebook group page for your potential summer staff. Not only will your posts on that page show up on their newsfeed, but you will also give them the opportunity to start communicating with one another before they arrive at camp. Do you find texting annoying and impersonal? Get over it, because the young adults you are inviting to serve with you expect this kind of accessibility that they have with their friends. Does your camp have its own Facebook page? Here is a rule of thumb for you: Do less, better. Don’t post stuff up there every day or they will simply stop following your page. Instead, post once a week or less, and do it up big. Always use a great original photo or video. Avoid simply posting links to cool stuff on the web – they can find that elsewhere. 5. Clarify expectations. “Imagine that you went into a blind person’s house when he wasn’t there and moved around all the furniture. What a mean thing to do! The poor guy would stumble over everything, because it wasn’t where he expected it” (CCL, p. 27). You don’t want your summer staff to walk in blind. Clarify what you expect of them! Before they arrive, send them a job description and your staff manual. Also, ask potential staff what they expect of you as their leader. 6. Provide information. Ask your former staff about the things they wished they had known before they arrived at your camp. Give your accepted summer team a thorough list of what to bring, especially things that are specific to your camp or their role (e.g., close-toed shoes for washing dishes, or a wetsuit for your freezing-cold lake). Include your camp’s history, in the form of creatively-told stories from the past. Send them their staff shirt ahead of the summer, so that people who see it can ask them about their upcoming opportunity. Make resources available to them: books to read, community courses to take, people to talk to, financial sources and high school or college credit to check out. 7. Offer training. Here is a shameless plug for my book, The Christian Camp Leader. Check out the reviews on Amazon, where camp leaders describe how they are using this resource. Send your staff a physical copy (email me for discount bulk orders), or gift them the synced eBook and audiobook versions. If you can, invite staff to weekend workshops. Or create online sessions for them to review, like this one from Camp Imadene. 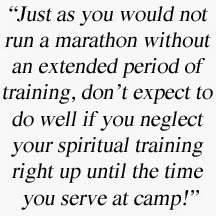 Make sure you include spiritual fitness training. Offer encouragement and challenge them spiritually. Give them homework, like writing up several outlines for cabin devotionals, or writing out their testimony. 8. Pray for them. Maybe you have read this far and thought to yourself, I don’t have time for any of this! No worries. Just make sure you do this last one – pray daily for your summer staff before they arrive for the summer. You have opportunity in Jesus’ name to speak into being the very things you want for them - and from them - this summer. Plus, you will find that your relationship with each staff member will gain a huge head start if you have already been thinking about and praying for them weeks ahead of time.